The "Interphone Study" is the name of a multi-country analysis on cell phones and associated brain cancer risk (May 17, 2010). The combined examination and results of the 13 countries participating in the Interphone Study are published in the "International Journal of Epidemiology". 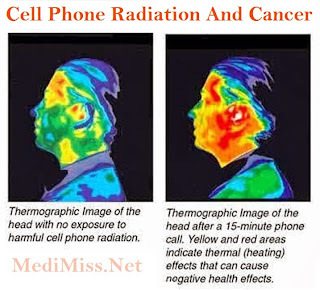 Find out why you are more likely to get brain cancer after using a cell phone. The study summarizes the data on mobile phone radiation and associated cancer risk. It reviews brain tumors, including acoustic neuroma (a tumor formed of nerve tissue) and tumors of the parotid gland. The data linked "heavy" cell phone use to a 40% increased risk of Glioma. The tumor would usually start on the side of the head that people hold their phone. If the person was right-handed, it would start behind the right ear. If the person was left-handed, it would start behind the left ear. However, the Interphone definition of "heavy" cell phone use is only ½ hour of use per day. The average usage for people today is well over ½ hour. Furthermore, the mobile phone does not have to be "in use" for this length of time. The fact that it is turned on, and in your bio-field, means that it is altering your body frequency and immune system. People have become accustomed to surfing the net, using social media, and even watching television on their smart phone. More and more apps are being developed for smart phone users. Many are cancelling land line use and switching to cell phone only. This means that as the usage of cell phones increases, so does the risk of brain cancer. Another cause for alarm is the amount of radiation we are subjected to from laptop and desktop computer monitors, hand-held e-readers, playbooks and i-pads. Radiation Safety standards are higher in most European countries. For example, the Swedish safety standard for computers is a maximum of 0.25 milligauss at 50 cm (about 20 inches) from your display screen. Many US and Canadian screens emit 5-100 milligauss at that distance. There is some disagreement as to what a "safe" reading is. Sweden has suggested a background reading of 2 milligauss. Other countries suggest 1 milligauss or less. The average time spent on computers has increased dramatically, just like the usage of cell phones. Children are more susceptible because their brains and immune systems are still developing. As the usage of computers and hand-held devices increases, so does the risk of brain cancer. In 1989 the US Department of Energy reported that "it has now become generally accepted that there are, indeed, biological effects due to field exposure" from EMFs. It is not just the short-term effects that are evident. Long-term studies are now surfacing showing a higher risk of various cancers due to EMF exposure. Short-term exposure can produce headaches, dizziness, lack of concentration, fatigue, heart palpitations, compromise immune function, affect sleep, decrease the effectiveness of therapeutic drug treatment, cause skin rashes and decrease mental and physical well-being. Long-term exposure can produce mutations, cancer and degenerative brain diseases. We are all living in a world that is contaminated with Electropollution. Isn't it about time that we find radiation protection for ourselves and our children?